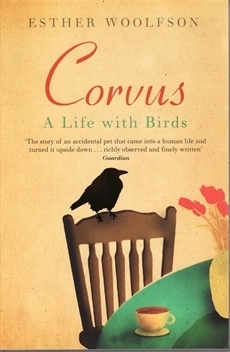 Corvus by Esther Woolfson is a remarkable book about the birds she has has had living with her; birds that were found out of the nest that would not have survived if she had not taken them in. ‘Corvus’ is a genus of birds including jackdaws, ravens, crows, magpies and rooks. The specific birds Esther Woolfson has looked after are a rook, called Chicken (short for Madame Chickieboumskaya), a young crow, a cockatiel, a magpie, two small parrots and two canaries. But it all started with doves, which live in an outhouse, converted from a coal store into a dove-house, or as they live in Aberdeen in Scotland, a doo’cot. I wept the night he died. Sitting in bed, filled with the utter loss of his person, I felt diminished, bereft. I talked about him, but not very much, in the main to members of the family, who felt the same, but to few others. It’s the only way, this compact and measured grief, for those of us who are aware that there has to be proportion in loss and mourning; we laugh at ourselves for our grief, trying to deal with this feeling that is different in quality, incomparable with the loss of a human being. Anyone who has lived through the death of a loved animal can recognise that sense of loss. Corvus is a beautiful book and I have learned so much by reading it. I must also mention the beautiful black and white illustrations by Helen Macdonald – I think this is the Helen Macdonald who was awarded the 2014 Samuel Johnson Prize for Non-Fiction for H is For Hawk. Esther Woolfson was brought up in Glasgow and studied Chinese at the Hebrew University of Jerusalem and Edinburgh University. Her acclaimed short stories have appeared in many anthologies and have been read on Radio 4. She has won prizes for both her stories and her nature writing and has been the recipient of a Scottish Arts Council Travel Grant and a Writer’s Bursary. Her latest book, Field Notes from a Hidden City (Granta Books), was shortlisted for the 2014 Thwaites Wainwright Prize for Nature and Travel Writing. She lives in Aberdeen. For more information see her website. It’s time for the Final Checkpoint for Bev’s 2014 Mount TBR Challenge. This is my favourite challenge as it really encourages me to read from my own bookshelves. It’s the most simple challenge €“ read your own books €“ that is, books you’ve owned prior to January 1, 2014. My target for 2014 was to reach Mt Ararat and I made it to the top (50 books read) and even a short way up Mt Kilimanjaro, reading a total of 53 of my TBR books! Seven White Gates by Malcolm Saville €“ TBR €“ Mt. Ararat! The Year in Review According to Mount TBR: Using the titles of the books you read this year, please associate as many statements as you can with a book read on your journey up the Mountain. Thanks, Bev for hosting and for your encouragement this year to climb mountains €“ I’m looking forward to climbing more mountains next year. Cause for Death is the seventh book in the Dr Kay Scarpetta murder mystery series. It’s a secondhand copy that had been on my TBR shelves for several years and I think I must have started to read it before as the opening chapter seemed very familiar. It begins well enough when a reported is found dead in the Elizabeth River in Virginia on New Year’s Eve. New Year’s Eve and the final murder scene of Virginia’s bloodiest year takes Scarpetta thirty feet below the Elizabeth River’s icy surface. A diver, Ted Eddings, is dead, an investigative reporter who was a favourite at the Medical Examiner’s office. Was Eddings probing the frigid depths of the Inactive Shipyard for a story, or simply diving for sunken trinkets? And why did Scarpetta receive a phone call from someone reporting the death before the police were notified? The case envelops Scarpetta, her niece Lucy, and police captain Pete Marino in a world where both cutting-edge technology and old-fashioned detective work are critical offensive weapons. Together they follow the trail of death to a well of violence as dark and forbidding as water that swirled over Ted Eddings. However, although the murder investigation was interesting I wasn’t all interested in the terrorist/FBI/religious fanatics scenes that followed. I don’t think I’ll bother reading any more of these books. It seemed the right time of year to read The Adventure of the Christmas Pudding and a Selection of Entrées by Agatha Christie. It’s a collection of six short stories but only the first one, the title story, has any Christmas connection. The Christmas fare was of gargantuan proportions. I was a skinny child, appearing delicate, but actually of robust health and perpetually hungry! The boys of the family and I used to vie with each other as to who could eat the most on Christmas Day. Oyster Soup and Turbot went down without undue zest, but then came Roast Turkey, Boiled Turkey and an enormous Sirloin of Beef. The boys and I had two helpings of all three! We then had Plum Pudding, Mince-Pies, Trifle and every kind of dessert. During the afternoon we ate chocolates solidly. We neither felt, nor were sick! How lovely to be eleven years old and greedy! But I don’t think this story reflects her own Christmas experience apart from the setting, that is, for this is a collection of crime fiction! Poirot is invited to spend ‘a good old-fashioned Christmas in the English countryside’ in a 14th century English manor house, a prospect that fills him with apprehension, only agreeing to go when he hears there is oil-fired central heating in the house. There is of course a reason for inviting him – for a discreet investigation into the theft of a priceless ruby stolen from a Far Eastern prince. The Christmas Pudding in question is a ‘large football of a pudding, a piece of holly stuck in it and glorious flames of blue and red rising round it’. For a short story this is really complicated with several twists for Poirot to work through. Four of the other stories feature Poirot, with the last one, Greenshaw’s Folly being a Miss Marple mystery, which I read last year in Miss Marple and Mystery. Greenshaw’s Folly is a house, an architectural monstrosity, visited by Raymond West (Miss Marple’s nephew) and Horace Bindler, a literary critic. Later, Miss Greenshaw having drawn up a new will, is found murdered. The remaining four stories concern the murder of a man found a Spanish chest (The Mystery of the Spanish Chest), a widow who is convinced her nephew had not killed her husband despite all the evidence against him (The Under Dog), a man who has inexplicable changed his eating habits is found dead (Four and Twenty Blackbirds), and a man who has the same dream night after night that he shoots himself is found dead (The Dream). I enjoyed reading these stories. They are of varying length and are all cleverly done, if a little predictable. It’s trite to say that Beryl Bainbridge’s An Awfully Big Adventure is ‘awfully good’ – but it is! First published in 1989 and shortlisted for the Booker Prize, this is set in 1950, as a Liverpool repertory theatre company are rehearsing its Christmas production of Peter Pan. The story centres around Stella, a teenager and an aspiring actress who has been taken on as the assistant stage manager. It’s semi-autobiographical based on Beryl Bainbridge’s own experience as an assistant stage manager in a Liverpool theatre. On the face of it this is a straight forward story of the theatre company but underneath it’s packed with emotion, pathos and drama. And it’s firmly grounded in a grim post-war 1950s England, food rationing still in operation and bombed buildings still in ruins overgrown with weeds. Stella lives with her Uncle Vernon and Aunt Lily, who run a boarding house. To a large extent Stella escapes real life, living in the world of her own imagination. Her mother is not on the scene, but Stella secretly phones her from a public phone box to talk about her life – her mother just says ‘the usual things’ to her. She’s an innocent, naive and impressionable, she’s troubled and confused, wanting to grow up quickly. She’s ready to fall in love and becomes obsessed by Meredith Potter, the company director, not realising he is simply not interested in her. After playing a cameo role in Caesar and Cleopatra in the next production, Peter Pan, she ‘manages’ Tinkerbell, shining a torch and ringing a little handbell. 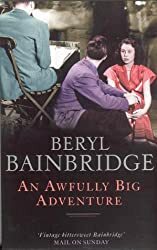 The title is taken from Peter Pan, the play about the boy who never grew up, whose attitude to death was ‘To die will be an awfully big adventure.’ Bainbridge’s use of Peter Pan emphasises the themes of reality versus imagination, the loss of childhood innocence, and the quest for love. Stella, whose mother had abandoned her, is most upset by the scene in the play where Peter tells Wendy how his mother had forgotten him when he tried to go back home – the windows were barred and another little boy was in his bed. It’s her mother’s apparent lack of love for Stella that is perhaps the initial cause of what eventually happens. Love in its various guises is a prominent theme running through the book. When Meredith asks her what she thinks J.B. Priestley’s play Dangerous Corner is about, she says: €˜Love. People loving people who love somebody else.’ And, indeed, An Awfully Big Adventure is about people who are in love with somebody else and they all have secrets to hide. I was a bit confused by the opening chapter and it was only when I reached the end that I understood it, when the truth that had been hinted at became obvious. It really is an awfully good book. The Call of the Wild and White Fang by Jack London are books that I’ve known about as long as I can remember – they were books my parents owned – but I’ve never read them, until now. So, I was pleased when The Call of the Wild, Jack London’s first book came out as my Classics Club Spin book. I would have read it one day anyway but the Spin gave me the nudge to read it now. I wasn’t expecting to find it such a beautiful, moving and poignant book, but it is. And it has so much packed into its 106 pages in my little hardback copy. The domesticated generations fell from him. 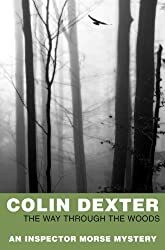 In vague ways he remembered back to the youth of the breed, to the time the wild dogs ranged in packs through the primeval forest and killed their meet as they tracked it down. It was no task for him to learn to fight with cut and slash and the quick wolf snap. After changing owners several times, each worse than the one before he is eventually saved from death by John Thornton who nurses him back to health and for a while it is the love between man and dog that keeps Buck with him. Eventually however, the call of the wild is too strong! I’ll be reading White Fang soon.